Calgary Jerseys and Apparel (a Skate Doctor company) is Calgary's trusted provider for custom jerseys, team uniforms, and sport, school or corporate apparel for every application. Would you like a jersey or apparel quote? Please complete our Contact Form and we'll get back to you. We offer an unlimited range of custom uniform options to match every design and budget. You can provide us with your desired price range and ideas (designs drawn on napkins are totally acceptable), or leave the creativity up to us. Most importantly, we work directly with you every step of the way to design and deliver custom solutions that you'll love. We believe in quality at a fair price, so we use Canadian goods and suppliers whenever possible. Why wait all season for your jerseys to arrive? We can get most orders in your hands and on the ice in as little as 3-5 weeks after design approval and deposit. Can't wait? We also offer rental of Skate Doctor branded jerseys (see below), and pre-designed and in-stock basic jerseys to expedite the process! We also realize that teams change over time, so we make re-orders as easy as possible. Choosing and designing jerseys and apparel can be overwhelming or confusing, but we're here to help, and we've listed some of our most popular options below. Want the ultimate in customization and design flexibility? Look no further, sublimation is your solution. 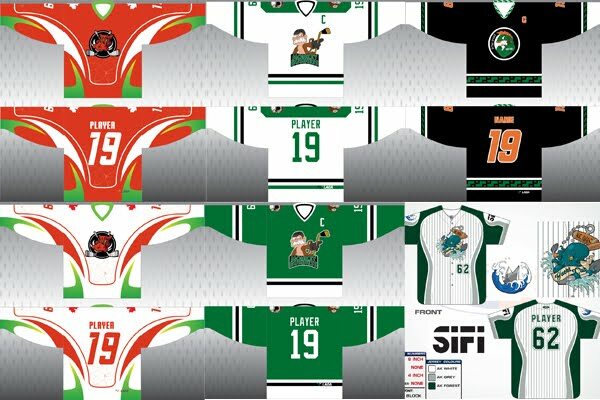 With sublimation, the designs, logos, names and numbers are dyed directly into any part of location of the jersey fabric. This creates a dynamic, light-weight and flexible option that won't crack, fade, peel or bleed. Most sublimation packages offer an "all-inclusive" price. Designs, logos (both team and sponsor), names, numbers and lettering are all included in the base price. No surprises or additional charges apply for your teammate with the long last name, or to get that extra sponsor logo added. With sublimation, small quantity re-orders are also accommodated very easily. Applique is a design that is made of custom cut fabric shapes that are layered upon each other and sewed into place. Tackle Twill is one of the most popular applique techniques. The logos, numbering and lettering you see on pro jerseys is usually a Tackle Twill applique. We also offer sublimation on twill. We get it, sometimes you want a simple jersey that represents your team but doesn't break the bank. Digital/direct print or silk screen is the most economical choice and fuses a printed graphic or number on top of the jersey fabric. This design can be prone to cracking, fading or peeling if not cared for correctly. Don't have or need a logo on the front of your jersey? That's OK, we can do numbers and/or names only. Embroidery uses different colored threads that are stitched into a pattern (or tackle twill) and applied onto an existing or custom knit jersey. The embroidery design is created by a computerized sewing machine using a "digitized" version of your logo. Embroidery is not not extensively used on jerseys anymore, but is very popular for decorating apparel such as hoodies, hats, and other clothing and promotional materials. Need a set of team hockey jerseys for a game, tournament, event or until your custom jerseys arrive? We offer a few sets of rental jerseys! Rental jerseys are adult XL and XXL sizing (including a couple goalie-cut), and have our Skate Doctor logo on the front and a unique number on the back. Simply pay a security deposit and a small rental fee, and the jerseys are yours to use for the term.